Break out the tinfoil hats, it's time for some conspiracy theories. Jeffrey Dean Morgan, who played Bruce Wayne's dad, Thomas Wayne, for all of three seconds in Batman v Superman: Dawn of Justice, says he'd be down to play Batman on the big screen. But unlike a lot of times when an actor throws out the 'Oh I'd love to play X or Y' line, this one might actually have a decent chance of happening. Here's why: Flashpoint. Subscribe: Pick up a subscription to Total Film magazine and get stories on DC, Marvel, Star Wars, and more delivered straight to you - digitally or physically! Flashpoint is not only the name of one of DC's upcoming superhero movies, but also a comic book mini-series. In said comics, The Flash accidentally creates an alternate reality where Superman is held captive in an underground lab, Wonder Woman and Aquaman are at war, and Batman is now Thomas Wayne, not Bruce. In this alternate timeline, instead of Bruce's parents being shot dead, it is Bruce himself who is killed by a mugger. This causes his mother Martha to go insane and become the Joker, while his father Thomas becomes a more brutal and vengeful version of Batman. 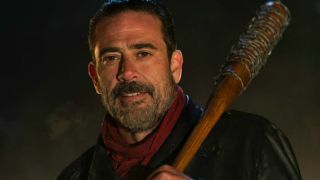 When asked if he was aware of this unique spin on the character, Morgan (currently tearing up the small screen as Negan on AMC's The Walking Dead and about to star alongside Dwayne 'The Rock' Johnson in Rampage) recently told Total Film, "Look, I’m not going to lie. Zack Snyder and I talked about doing Batman together when we did Watchmen. I think it was both he and I’s favorite character and favorite story. "And what I know about the Flashpoint Batman is, you know, for me, I think he is not only the darkest of the Batmen, but the coolest. And I love his whole storyline and who he is and the tortured soul of it all." Note that when Morgan says "favorite character and favorite story," he's likely referring to Batman in general, not specifically the Flashpoint version. After all, the Watchmen movie adaptation came out in 2009, while Flashpoint wasn't published until 2011. In any case, it sounds like this isn't the first time the idea of Morgan as an older, grizzled Batman has been floated. But will it actually happen? "We’ll see. I mean, look, DC is DC and they’ll figure out what they’re going to do next," Morgan said. "But I’m highly aware of the character, I will say that. I’m highly aware of the character, and it would probably be a thrill of a lifetime to put on the Batsuit." Time will tell if this ends up being another case of wishful thinking (remember how we were all so sure that Jared Leto's Joker was actually a twisted version of Robin? ), I have to agree with Morgan; it would certainly be a thrill. Want to know more? Grab a Total Film subscription and stay on top of what's new and exciting in the world of cinema.